If you haven't seen The Great British Bake Off, then you may not know who Paul Hollywood is. But it's a brilliant show and if you haven't watched yet, you are really missing out. The lady who I rent a room from received a copy of Paul Hollywood's recipe book as a gift, which goes into details on techniques and tips for baking. It's got some wonderful recipes in there, so well worth a look. You can purchase it from amazon.co.uk. I would love the challenge of baking everything in this book and of course sharing my experience with those who are interested. Those I live with are not objecting to this idea and if word gets out that I'm on a mission to conquer Paul Hollywood's baking techniques, we may get a few more visitors. 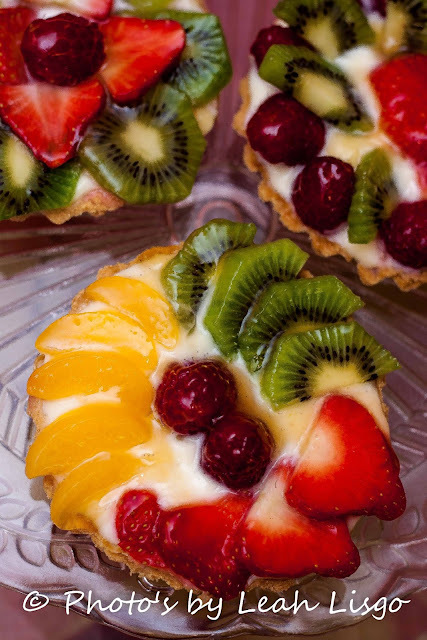 The first thing I attempted to make from the recipe book was the fruit tart. 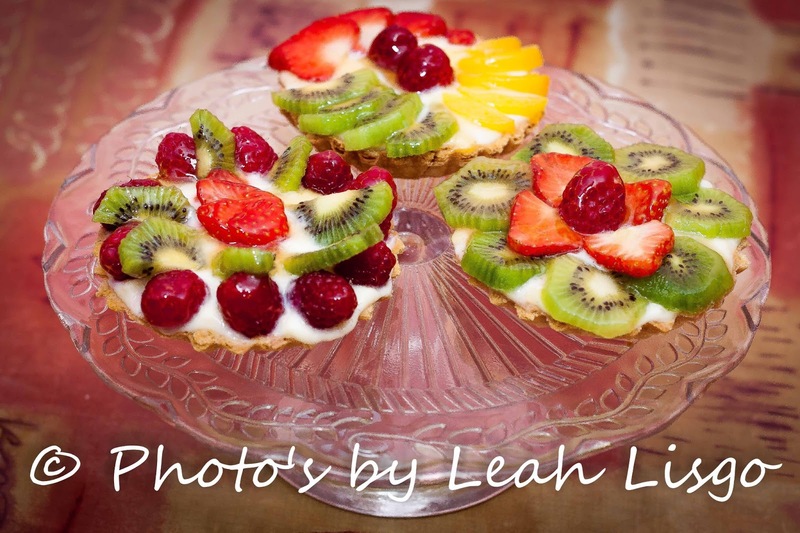 I LOVE any fruity desserts and had been dying to try making a creme patissiere. So this recipe was shouting at me to be made. I treated myself to some mini loose base flan cases. So I could now make individual servings, I was so excited. The recipe in the book is for an apricot tart and originally that's what I was going to make. But then I decided I'd have some fun and get creative with designs and colours. This was a fairly simple recipe to make, I didn't really have any problems considering it was my first attempt. I did cheat with the pastry and bought ready to roll pastry. The most time consuming part of making these tarts was preparing the fruit, then designing my toppings. Of course this would have been much quicker if I had stuck to just using apricots, but I had a lot of fun and think they look pretty good. The fruits that I used were, strawberries, kiwi fruit, raspberries, tinned peach slices. Look out for further posts as I work my way through the recipe book. Mmm, delicious! Can't wait to see more and read about your adventures baking your way through it. I've always been intimidated by pastry but have been dabbling lately and it's not as scary as I thought it was. It's really easy if you have a food processor - give it a whirl! Yes I keep getting told it's not so hard and I do want to try. But I don't always like to put too much pressure on myself at one point. Making Creme Patissiere, was enough for me to concentrate on this time. But next time I should try making my own. I'd love to learn the art of pastry baking!